If the subject is singular the verb must be singular. If the subject is plural the verb must be plural. 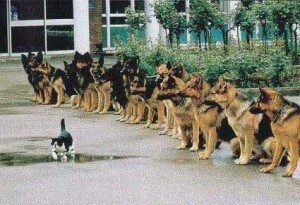 The cat is walking, but the dogs are standing. • The child goes to school every day. • The children go to school every day. • If people want to be good at something, they have to work hard. • If you want to be good at something, you have to work hard. Remember: Single subject, single verb. Plural subject, plural verb. Use is or are to complete each sentence. Good evening. Here ___ the news. Fifty Euros ___ a lot of money. Fifty Euros is a lot of money. Athletics ___ my favourite sport. Athletics is my favourite sport. The stairs ___ by the door. The stairs are by the door. The furniture in my flat ___ very old. The furniture in my flat is very old. Further information ___ available at reception. Further information is available at reception. The scissors on the table ___ mine. Physics is not an easy subject. One of my friends ___ meeting me at the airport. One of my friends is meeting me at the airport. one of . . . means one from a group so, it is singular. Physics ___ not an easy subject. Use one of the words in brackets to complete each sentence. One of my ex-girlfriends is leaving Poland this week. The rest of the staff are coming later. Each man and each woman has the right to vote. Each means one. So, here we are thinking about men and women separately. Four months is not long enough to spend in one country. Four months is one period of time, so it is singular. Five thousand Euros was given to the dogs home. The cost of the most important ingredients has risen. Choose from the verbs in brackets to complete each sentence. Most of the fruit ___ gone bad. Fortunately, there ___ seven oranges still in the fridge. Most of the fruit has gone bad. Fortunately, there are seven oranges still in the fridge. Fruit is uncountable, so a singular verb is needed. There are seven oranges in the fridge, so a plural verb is needed. A committee was appointed to investigate the crash. Here we think of the committee as a single organisation. So, a singular verb is needed. Vlad is one of the students who has failed this year. A group of students, but we are only thinking about one of them: Vlad. So, a singular verb is needed. Not only the students, but also their instructor was caught in the avalanche. When we have the need for both a plural verb and a singular verb we choose the subject closest to the verb. Here the singular instructor is the closest. So, a singular verb is needed. Fish and chips reminds me of England. Fish and chips is one dish. So, a singular verb is needed. Many voters still vote as their parents did. Here we think of the voters as acting separately when they vote. So, a plural verb is needed. A number of students were caught smoking marijuana. Correct. A number of means some. So, a plural verb is needed. The number of cars on the road this weekend are lower than usual. Wrong. The number of means this is a certain number. The number of cars is meant to be taken as one number. So, a singular verb is needed. The economics of this country seems to be in a mess. Wrong. Here economics means the different parts of a country’s financial health. So, a plural verb is needed. When the word economics talks about a university course or the subject, it is singular. Politics is a big joke in this country! Correct. Here Politics talks about the subject. So, it is one thing and needs a singular verb. Neither the blue paper or green towels matches my new bathroom. Correct. Here we are looking at the blue paper and green towels as separate items. So, a singular verb is needed. The chocolate biscuits, which looked good on the plate, were tasteless. Correct. Here we are looking at lots of chocolate biscuits. So, a plural verb is needed.